Eliza March Writes: Self publishing? What are you doing about the book cover? Design it yourself ! Romance author and editor shares tips, free reads, and books. Self publishing? What are you doing about the book cover? Design it yourself ! Here are the steps I took to make my most recent cover -- from purchased images edited with Photoshop the way I wanted them, to the added and arranged text information, to the final step...it was fun. The cover image I created is now ready to be inserted into Amazon's Cover Creator on CreateSpace. It takes some practice to get the first step down. But you can move stuff around, increase or decrease size and transparency, or vary the colors to your personal taste. If you like doing this sort of thing, it can be rewarding and satisfying. 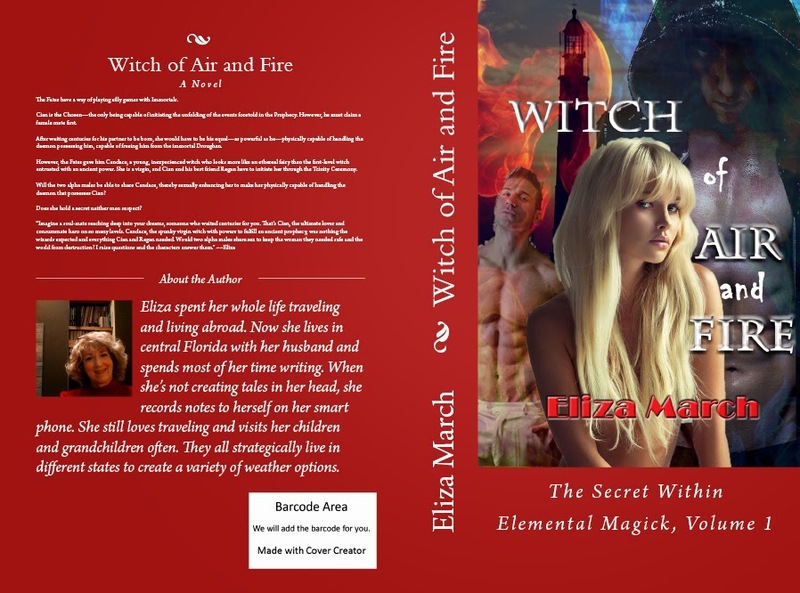 Witch of Air and Fire will be a re-release of a book I am receiving my rights back to this year. The original cover was very nice, so I wanted to make certain the new edition cover was as effective in telling the story. #ebook #$.99 at SMASHWORDS this weekend. #FREE READ Writing the Book. What was I thinking? It's Insecure Writer's Support Group Wednesday Again. Come see what's bothering me. I have taken down all photos with questionable origination. Since I'm fanatical about giving credit where credit is due and totally onboard with anti-piracy, all photos used were from the internet and presumed to be public domain. Everything here is used for entertainment purposes. Please contact me immediately if anything posted on this site is copyrighted elsewhere, and I will either request your permission to use it, remove it or credit it properly. All photos appearing here will be used only with the permission of the copyright holder. The FTC recently published rules about disclosure for amateur bloggers. I am an amatuer blogger who doesn't get paid to write this blog. I am an author, an editor, a reviewer and a reader. I also have friends who are authors, editors, reviewers, and publishers. It is safe to assume that I may have a vested interest in some of the books I recommend or mention on my blog. When books I write or edit are sold, I'm compensated by royalties and commissions. My opinions may not be objective so consider yourself forewarned. All Rights Reserved Copyright Eliza March 2009. Awesome Inc. theme. Powered by Blogger.